This site is from George Sullivan another competitor in the 2006 La Carrera Panamericana. Sit back and enjoy. Courtesy of Gerie Bledso here is a short video courtesy of one of last years sponsors. In 1953 World Champion Juan Manuel Fangio won the Pan Am for Lancia without winning one daily “leg.” But his accumulated time over the entire event was significantly lower than his nearest competitor. He knew how to pace himself and conserve his equipment when others were slowed by mechanical problems. This is exactly my philosophy and this is how Jon and I will run this race. Many were surprised by the fact that Gabriel Perez won overall last year in a car that ran far less horsepower in a slower class but it was no surprise to Jon and me at all. This long race that has so many variables is nothing short of war which requires a team to adapt to one's surroundings, then make the needed adjustments to carry out one's mission. Nobody will ever truly conquer the La Carrera Panamericana but just to survive is to be triumphant. Speaking of Shelby GT350's.... Attrition knocked out the beautiful ’66 Shelby GT-350 “R” Code driven by Gerie Bledsoe and Chris Cooper, navigator). This car, a replica of the “R” Code driven by Mexican and US Champion regional Fred Van Bueren in 1966-1968, was running in third overall when it developed engine problems. Van Bueren’s original car sold recently at auction in London for $746,000. Here are some of the original writing by James K. Lamona AUTO SPORT Review, United States, March of 1953 which pretty much still sums it up even today some 54 years later. The 3114 km mexican road that stretches south to north from Tuxla to Juárez is, according to Alfred Neubauer, a combination of Tripoli's Grand Prix. 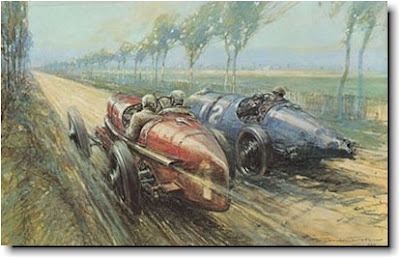 the italian "Mille Miglia", the german "Nurburgring" and the Le-Mans 24 hrs. Exactly, what makes The Mexican Road Race so tough? It is a combination of several things. The race begins on a tropical climate, where the temperature is high and humid and continues along a road that goes from sea level to a suffocating 3 thousands meters altitude! Temperature variations go from 34 celsius degrees to almost 2 degrees before freezing all in just 72 hours. Dangerous as it is, The Mexican Road Race has come to be considered as the premier event of world racing. Next years event will certainly gather a bigger group of skillful and defying drivers whom will be seeking the mythical “King of Drivers” crown. The Carrera Panamericana has long earned such names as "World's Longest Road Race", "Battle Of The Giants", "Mexican Road Race", "The Most Dangerous Race In The World", "World's Toughest Race", "Most Grueling Race In Any Calendar", The Salad" or "How to see Mexico in just 7 days at 160 miles per hour." In the early fifties there were so many deaths (24 in one race alone) that the race was canceled for a few years. But since it's return, this being the 20th anniversary race since it's rebirth, it has done so well that the Mexican Government has asked the organizers to extend it all the way back to it's original finish line at the Texas border. I guess they feel it's what the people and racing fans of Mexico and the rest of the world want to see and why not. Jon and I agree and our motto is, if you're gonna do it why not do it all the way! Hey, wanna go for a nice ride in the country? Anyone that knows me well will tell you I am a Hemingway enthusiast and not only do I have a great love and respect for all his works but in fact have fished and hunted in many of the very same locations he did including many parts of Africa. Two of my favorite Hemingway quotes are, "Every man's life ends the same way. It is only the details of how he lived and how he died that distinguish one man from another." and the one that stands out the most for me is, "Auto racing, bull fighting, and mountain climbing are the only real sports ... all others are games." In the northern Spanish city of Pamplona there is a long-standing tradition better known among Pamplona residents as "The Running of Bulls", the event achieved international notice thanks to Ernest Hemingway and his 1926 novel "The Sun Also Rises." "He took a small town festival and really immortalized it in his words so well and so eloquently … that it became romantic," said Hilary Hemingway, an author, documentary filmmaker, and niece of the famous writer. After my book "I Slept In Africa" made the Forbes book list my wife and I were the guest of Ernest Hemingway's son, Patrick Hemingway at his home in Montana. One evening he asked me, "You race cars, what do you feel before a big race?" After giving the question some thought I explained... "Respectfully using one of your father's own quotes as a basis for my answer. I feel the same excitement, shortness of breath, adrenaline rush, exuberance and rush that a bull fighter, a mountain climber or even a runner in the Running of Bulls must feel. I can now honestly say that the preparation for the upcoming La Carrera Panamericana is nothing short of a daily dose of all of the above. Furthermore, I can also say that in looking back I have learned taking part or even winning a race means very little without all that takes part in getting both physically and mentally prepared let alone all that is involved in the process and details of building a winning car and team. None will do well without the other. 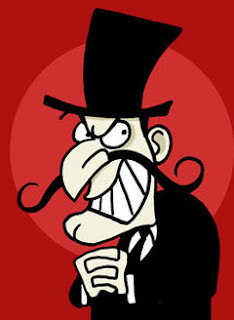 Hemingway wrote, "There are people who love command and in their eagerness to assume it they are impatient at the formalities of taking over from someone else. I love command since it is the ideal welding of freedom and slavery. You can be happy with your freedom and when it becomes too dangerous you take refuge in your duty. I was bored with this since I knew myself and my defects and strengths too well and they permitted me little freedom and much duty." Here's a video about the 1990 La Carrera Panamericana. It's an hour long but fun to watch. Sit back and drink a cold one while you enjoy this video but also keep in mind this was run 17 years ago and the cars that will be running this year use considerbly more technology than back then. Pink Floyd's David Gilmour and Nick Mason took to the road in October 1991 to take part in La Carrera Panamericana, a hair-raising revival of the legendary car race. The magnificent Mexican landscape and vintage cars perfectly match Pink Floyd's powerful score. Selections include: "Run Like Hell," "Pan Am Shuffle," "Yet Another Movie," "Signs of Life," "Carrera Slow Blues" and six others. Some pretty big driving shoes to "Phil"
I was fortunate to spend a day with Phil Hill one of the greatest drivers of all time. In the history of the international Formula 1 Grand Prix Championship, the highest prize in the world, only two Americans have taken home the coveted GT Crown: Phil Hill in 1961 and Mario Andretti in 1978. Phil was the first American to win the classic 24 Hour race at Le Mans, the first American to win three times at Sebring, the first American to win a modern championship Grand Prix and the finally become the first American Champion. Between his sports car and Grand Prix victories, Phil Hill won more races for the Ferrari team than any other driver to date. By now it should be obvious that I am a big Phil Hill fan and you are probably going to ask what does this have to do with La Carrera Panamericana? On the day that I was so lucky to spend with Phil we chatted back and forth about so many things, all racing, but as we were getting ready to say our goodbyes I thanked him for everything and then I said, "Phil, what a pleasure it has been to have met a man who has won so much... Le Mans, Sebring, Grand Prix's and so much more." But he leaned over, winked and said to my son, "Yeah, but unlike you, I have never won a 25 Hour." Phil is a fine gentleman and not only can he drive but he really knows how to make a man feel special as well. And today as I was reading my newest collection to my library I found a quote by none other than Phil... "The Panamericana ranks as the greatest race of my life, only the Mille Miglia could come close." This photo was taken with Phil and myself at Sears Point. Wrong... I am always amazed how far technology has brought even what seems like the simplest components on a race engine. Take the headers on this engine for example. For years I have built hundreds of small block Ford high performance engines and there was basically only one header I used for almost every single one of them. Needless to say I was brand loyal. 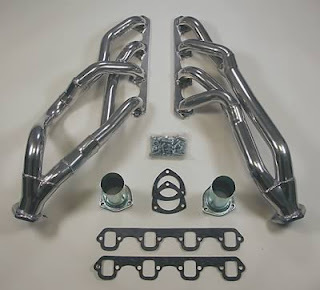 That does not mean that I simply took them for granted so in keeping with my own rule of "what if racing" I began researching various headers so as to obtain the maximum performance and horsepower but what I found out was almost shocking to me. First of all, the brand I had been loyal to for so many years are no longer a "top of the line" product as it seems to be living entirely on it's name recognition. I on the other hand don't need name recognition when it comes to parts. What I do want is performance and like everything else, performance does not come without a price. Furthermore the good ole days of paying a couple "C" notes for some adequate headers are long past. Today a good set of headers will cost between $600 to $1800. But why build a great motor and then choke it out with the wrong tubes? That's makes about as much sense as running the 24 Hours of Daytona on a set of Sears tires doesn't it? After weeks of research I chose a set of Doug's ceramic coated tri-Y headers. My cast iron heads are built in a way so that they can utilize either big tube 1 3/4 tube size headers of the smaller 1 5/8's tube size. But when I assumed my engine builder would want the larger size I was reminded what "assume" translates to. The design of this high performance engine is one that LOVES the restriction of the 1 5/8 tubes that open up to the larger bore enabling it to have tons of low end torque and then being able to enjoy all the top end excitement any driver can possibly take. Even Jon and I can't be building race cars every day so today we took some time to go play at Sears Point. While my son Will was performing his duties at NASA Race director, Jon and I found time to enjoy the wet conditions on the track. I always enjoy watching Jon maneuver thru traffic but today was even more entertaining as he had to deal not only with traffic but rookies, rain and deer. Yes, I said deer! The rain was coming down in buckets, cars were spinning off the track, rookies were doing what rookies do which is primarily everything except what they are supposed to be doing when out of nowhere here comes Bambi running across the track, down thru the infield and out the other end of the paddock. I had to laugh later because it seems from the stories I heard, almost every car on the track "almost hit that deer." Or maybe there were more than the one I saw. LOL. Later in the day Jon and I hung out with my good friend Randy Pobst and talked cars and racing and how well Randy had driven at the recent 2007 Rolex 24 hours of Daytona. Randy mentioned how much he would like to drive with us in the La Carrera Panamericana. At last years 25 Hours Of Thunderhill Randy drove a stint for me as well and he is an awesome driver to watch. While Jon hung out with Randy I spent some time with a very nice gal whom I had wanted to meet. It was none other than Rachel Larratt who is better known as “Chica Loca” which is Spanish for ”Crazy Girl” who ran last years La Carrera Panamericana in the exhibition class in her 2006 Lotus Elise. With a huge smile, Rachel told me, "When we drove in the rain last year during the La Carrera Panamericana I had done really well so I thought I had this rain driving thing handled. But after driving here in the rain I realize I need some help." LOL. All things considered Rachel drove very well and I am looking forward to having her drive with us some more this year since she is going to compete in NASA's endurance series this year. One thing I have learned over the years is, there is safety equipment and then there is GOOD, WELL ENGINEERED equipment. The question starts out, "If you were rolling down a canyon after bouncing a burrow to meet his maker off your fiberglass grill, what kind of a roll-cage would you want? One that looks good or one that can save your life?" Well, the answer in my case is a no-brainer and that's why I chose IMPACT ENGINEERING to design, build and install our cage. Just take a look at this true work of art done by a master and keep in mind it's far from being finished yet. The film crew has been filming it using time-lapse photography. And we even have our new hood and the radiator in just for looks and to get some measurements. Last week after I began looking at the Griffin aluminum radiator I realized it was not exactly what I was looking for nor was the quality that I would have expected. Since then I have sent two radiators back to have them exchanged for something better but even those were less than I had hoped for. So after what seems like 20 hours of research and 200 phone calls later, I have found what I need. 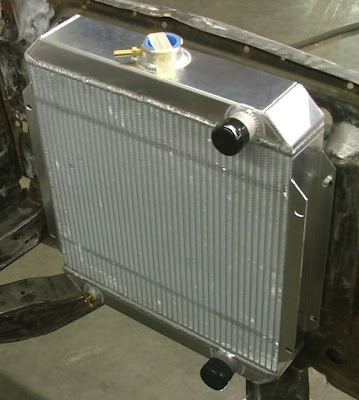 It is a special/purpose built aluminum radiator from FLUIDYNE high performance radiators. Building cars like this can require many such "adjustments" and research if you want then right the first time. It's easy to get caught up in, "So and So said this is the best part." and then even easier to simply "make'er fit" knowing that it's not quite what you wanted. But that's where being a perfectionist comes in handy. Just don't do it if it isn't absolutely perfect. Few changes in the rules are expected this year, but super Historic cars, like the Corvette, Shelby Mustang, Cobra, Camaro, Falcon, Monte Carlo, and limited edition factory race editions, and even “specials” may well be moved into a new class, Historic D. These cars should be allowed to run four-barrels and other speed equipment. This would make competition in Historic C better for those driving less exotic Detroit iron. Like I said, we do not not know if this will happen or not but we may find out as soon as this month or in March. This has major ramifications for many of us for obvious reasons. For example, will the Historica D class be allowed to use aluminun heads and what is, "other speed equipment?" Will 5 speed transmissions be allowed and so on. Right now as it is, my engine builder has already purchased most of my engine parts including special built cast iron heads and work is beginning on them soon. I sure would hate to have them completed only to find out the rules had changed. So for now, it's pins and needeles until the rules commitie finalizes the rules.